SCVHistory.com | Tejon Ranch | Beale Heirs Sell 276,000-acre Tejon Ranch to L.A. Times-led Syndicate, 1912. Beale Heirs Sell 276,000-acre Tejon Ranch to L.A. Times-led Syndicate. Los Angeles Times | Reported Sunday, May 12, 1912. Curiously, or maybe not so curiously, the L.A. Times doesn't identify the buyers or the sales price. The syndicate was led by Times Publisher Harry Chandler and land developer Moses H. Sherman (as in Sherman Oaks). Sherman was the water commissioner who, in the early 1900s, got advance word of L.A. Mayor Fred Eaton and Engineer William Mulholland's acquisition of Owens Valley water rights. Sherman told his friends, including Chandler, and together they snapped up cheap land in the then-arid San Fernando Valley. Here, they're clearly hopeful for future water development and rail service. The syndicate incorporated its Tejon Ranch venture in 1936 and took the company public but retained a controlling interest. A century later, as the Tejon Ranch Co. prepares to build 32,450 homes in northern Los Angeles County and southern Kern County, the major shareholders are hedge funds. We've bolded some interesting passages in the text. Ranch Almost As Big As Rhode Island Is Sold To A Los Angeles Syndicate. One of the Largest Real Estate Deals Ever Put Through in California. Historic Tejon Ranchos Sold by the Beale Heirs. A Princely Domain With a Romantic History. Nearly Three Hundred Thousand Acres. 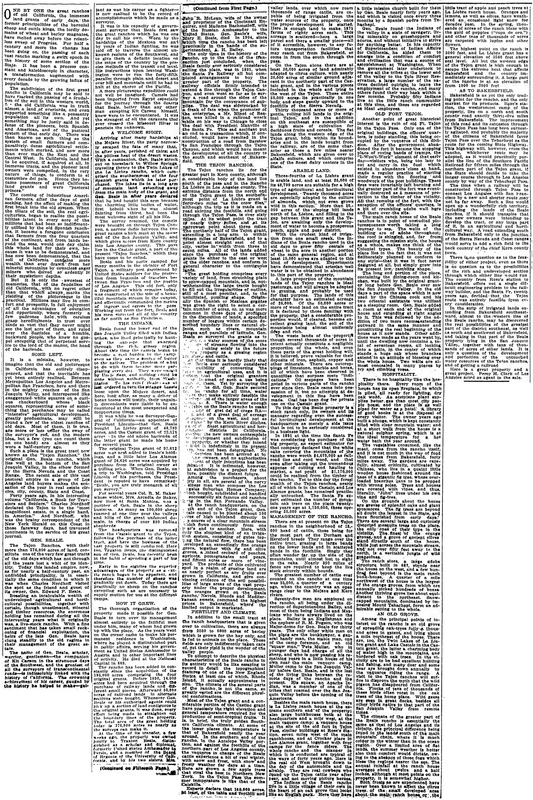 Los Angeles Sunday Times | Sunday, May 12, 1912. One by one the great ranchos of old California, the immense land grants of early days, the former principalities of the baronial sheep and cattle kings, the lordly domains of wheat and barley magnates, have melted away before the relentless sweep of Progress. For half a century and more the change has been going on, the passing of each vast rancho marking a swift epoch in the history of some section of the State. It has been a process constant and kaleidoscopic in character, a transformation augmented with every decade by the growing Influx of population. The subdivision of the first great rancho In California may be said to have marked the passing of a feudalism of the soil in this western world, for the old California was in truth almost a land of overlords, and even supported something like a peasantry population all its own. And yet something may be justly said in defense of the pioneers, both Spanish and American, and of the pastoral system of that early day. There was then known no such thing as the system of small farmers and comparatively dense agricultural settlements which marked, and now more than ever mark, the East and the Central West. In California land had to be acquired, if acquired at all, in immense tracts, and the pioneer land owners were compelled, in the very nature of things, to conform to el costumbre del pais. Hence they became possessors of great California land grants and were "pastoral princes." The coming of industrious American farmers, after the days of gold seeking, had the effect of making the first break into the old system. When the tillers of the soil, the real agriculturists, began to realize the possibilities latent in every acre of the millions that had been so indifferently utilized by the old Spanish ranchers, it became a foregone conclusion that farmers from the four quarters of the continent, and from lands beyond the seas, would one day claim this whole land for their own, because it was to be demonstrated, and has now been demonstrated, that the soil of California contains more wealth than ever drawn from her mineral mountains by countless eager miners who delved so ardently in their mysterious depths. But it is only the sweetest of memories, that of the feudalism of old California, with no regret other than that which always marks the yielding of the picturesque to the practical. Millions may live in comfort and prosperity, in full enjoyment of all the advantages of education and opportunity, where formerly a few padrones held with careless grasp hereditaments in trust over lands so vast that they never might see the last acre of them, and ruled over the destinies of a humble, backward people, who knew no gospel excepting that of perpetual service to the lord of the manor, the head of the hacienda. It is a mistake, however, to imagine that the old and picturesque in California has entirely disappeared, and that the inevitable has yet been entirely realized. Between Metropolitan Los Angeles and Metropolitan San Francisco, here and there in the mighty reaches of the San Joaquin Valley, and interspersed like exaggerated white squares on a curious checkerboard whose black squares, representing acres of something that perchance may be called "intensive" agricultural development, greatly predominate, may still be found a few of the oldest ranchos of old days. Most of them, it is true, are more or less under the sway of the surveyor's rod, and the modern idea, but a few (you can count them on one hand) are almost as they were a half-century ago. Such a place is the great tract now known as the "Tejon Ranchos," the original Gen. Beale rancho, which lies well at the bottom of the San Joaquin Valley, in the elbow formed by the Sierra Nevada and the Coast Range. The recent sale of this vast pastoral empire to a group of Los Angeles land buyers makes the sensation of the year in real estate circles, city, county, State and Coast. Forty years ago, in his interesting volume "California, a Book for Travelers and Settlers," Charles Nordhoff declared the Tejon to be the "most magnificent estate, in a single hand, in America." And Nordhoff, who was the brainy correspondent of the New York Herald on this Coast in those faraway days, had traversed continents in the service of his great journal. The Tejon Ranchos, with their more than 276,000 acres of land, constitute one of the very few great tracts of the old days which has not through all the years lost a whit of its identity. Today this landed empire, now, as for nearly a half-century past, an undivided principality, is in essentially the same condition in which it was when Charles Nordhoff visited the spot as the friend and guest of its owner, Gen. Edward F. Beale. Boasting an incalculable wealth of undeveloped agricultural and horticultural possibilities, together with certain, though unestimated, mineral and timber resources, the enormous holding has remained during all the intervening years what it originally was, a live-stock rancho. With a fine sentiment that has taken small reckoning of financial exploitation, the heirs of the late Gen. Beale have clung steadily to the old regime in their management of the great estate. The name of Gen. Beale, scholar, warrior, gentleman — the companion of Kit Carson in the strenuous days of the Southwest, and the greatest of all the surveyors of transcontinental roads — is indissolubly linked with the history of California. The crowning achievement of his career, gauged by the history he helped to make — gallant as was his career as a fighter — is now realized to be the record of accomplishments which he made as a surveyor. It was in his capacity of a government surveyor that Beale first saw the great ranchos which he was one day to call his own. Worn by the hardships of the Mexican war and by years of Indian fighting, he was told off to traverse the almost unknown regions of the Southwest, and to give them a definite location on the maps of the country by the precise methods of the transit and level. His instructions upon leaving Washington were to run the forty-fifth parallel through plain and desert and over hill and mountain until he had to halt at the shores of the Pacific. A more picturesque expedition could not well be imagined. Camels had been imported from Egypt especially for the journey through the deserts that Beale, better than any other man excepting Kit Carson himself, knew were to be encountered. It was the strangest of all the caravans that ever crossed the Missouri River to penetrate the unknown. Arriving after many hardships at the Mojave River, the party narrowly escaped the fate of many that, in after years, perished of thirst and the pitiless heat of the desert wastes. With a companion, Gen. Beale struck out on horseback to Willow Springs, traveling thence to the Twin Lakes of the La Liebre rancho, which comprised the southernmost of the four Spanish grants which he later purchased. The lakes like in a long arm of mountain land extending away from the main body of the grant, and Gen. Beale in after years declared that he had bought this arm because the charming little bodies of water, first beheld when he was almost fainting from thirst, had been the most welcome sight of all his life. The survey resumed, the camels were brought on through Tejon Canyon, a narrow defile between the two great ranges which meet at the lower end of the San Joaquin Valley, and which gives access from Kern county into Los Angeles county. This pass lies in the Castaic grant, a part of the present "Tejon Ranchos," which they have come to be called. Beale and his party camped for many months in the vicinity of Fort Tejon, a military post garrisoned by United States soldiers for the protection from brigands of travelers between San Francisco and the pueblo of Los Angeles. This old fort, only a fragment of which remains today, was constructed at the side of a beautiful mountain stream in the canyon, and effectually commanded the means of ingress and egress to the pass. Working out from the fort, Beale and his men surveyed all of the country as far north as San Francisco. Beale found the lower end of the San Joaquin Valley filled with Indian tribes, who lived principally by hunting the antelope that swarmed through the rich, grassy region. About this time the camels began to become a real burden to the camp even as they were a source of terror to the natives. The problem of what to do with them became more perplexing every day. They were owned by Uncle Sam, and nothing could be done without authority from Washington. To his relief Beale was at last ordered to turn the strange beasts loose upon the Mojave desert, and here, long after, as many a driver of borax teams will testify, their ungainly descendants were liable to be encountered at the most unexpected and inopportune times. It was while he was Surveyor-General of California — an appointee of President Lincoln — that Gen. Beale bought La Liebre grant of 48,799 acres, and the Castaic grant of 22,178 acres. In the old adobe hacienda of the latter grant he made his home for several years. The original Tejon grant of 97,612 acres was next added to Beale's holdings, and a little later Los Alamos grant of 26,626 acres was acquired by purchase from its original owner at a trifling price. When Gen. Beale, on a trip to Washington, told President Lincoln of his purchases, the President is reputed to have remarked, "Beale, you are truly monarch of all you survey." For several years Col. R.M. Baker whose widow, Mrs. Arcadia de Baker, now lives in Santa Monica, was a partner of Gen. Beale in the sheep business. As many as 100,000 sheep roamed at one time over the valleys and hills of the great unfenced domain, in charge of over 300 Indian shepherds. The headquarters was removed from the Castaic grant to the Tejon, following the purchase of the latter tract, and here the business of the vast property is still conducted. Here too, Truxton Beale, the distinguished son of Gen. Beale, has recently been in the habit of spending a part of his time. Early in the eighties the superior advantages of the property as a cattle ranch began to be apparent, and therefore the number of sheep was gradually cut down. Today there are practically no sheep on the ranchos excepting such as are necessary to supply mutton for use at the different camps. The thorough organization of the property made it possible for Gen. Beale to turn over its management almost entirely to the faithful men under him, many of whom had grown up with the place. As the years went on the owner came to make his permanent residence in Washington, where he played a distinguished part in public affairs, serving his government as United States Ambassador to Austria and in other important lines of activity. He died at the National Capital in 1889. The rancho has been added to constantly since the acquisition of the 195,000 acres comprising the four original grants. Before 1890, 14,000 acres had been acquired through the purchase of railway lands and different small pieces. Afterward 50,000 acres of railroad lands in alternate sections were bought. Whenever Gen. Beale or his authorized agents could pick up a section of land contiguous to the original grants, it was done, every effort being made to straighten out the boundary lines of the property. The total area of the great holding today is 276,000 acres as nearly as the surveys can make it. At the time of the transfer, a few weeks ago, the property was owned jointly by Truxton Beale, distinguished as a scholar and diplomat, formerly United States Ambassador to Persia, and a member of the Board of Regents of the University of California, and by his two sisters, Mrs. John R. McLean, wife of the owner and proprietor of the Cincinnati Enquirer, and Madame Bachmetieff, wife of the Russian Ambassador to the United States. Gen. Beale's wife, Mary E. Beale, died in 1904, since which time the rancho has been left practically in the hands of the superintendent, A.H. Bailey. The only time in the history of the rancho, up to the time of the transaction just concluded, when the Beale family ever seriously considered selling the place, was in 1891, when the Santa Fe Railway all but completed arrangements to buy the greater part of the property. The railway officials firmly intended to extend a line through the Tejon Canyon, and even went so far as to survey a road around the sides of the mountain for the conveyance of supplies. The deal was sidetracked by a freak of fate when the promoter of the enterprise, a Mr. Minot of Boston, was killed in a railroad wreck while on his way to Chicago to close the deal with President Manville of the Santa Fe. This sad accident put end to a transaction which, if concluded, would have resulted in the construction of a road from Barstow to San Francisco through the Tejon Canyon, and which would have meant the development of all the country to the south and southeast of Bakersfield. The Tejon ranchos lie for the greater part in Kern county, although a considerable body of the land lies south of the pass and in the Rancho La Liebre in Los Angeles county. The extreme distance from the north end of the Tejon grant to the southernmost point of La Liebre grant is forty-two miles "as the crow flies," although the trip as it is made on a road skirting the foothills, and going through the Tejon Pass, is over sixty miles. At its widest point the tract is nearly thirty miles, and at its narrowest point about three miles. The northerly half of the Tejon grant, extending in a long arm to within fifteen miles of Bakersfield, and to a point almost straight east of that city, varies in width from three to seven miles. All of the lands added since the purchase of the original grants lie either to the east or west of the older ranches, and conform in general character to the contiguous lands. The great holding comprises every variety of land, from stretching plain to snow-capped mountain, and is, notwithstanding the large tracts bought to fill out the irregularities of outline, still of a most peculiar, and, to the uninitiated, puzzling shape. Originally the Spanish or Mexican grantee was given the right to select a certain number of acres, or, as was more common in those days of profligacy in the disposition of lands, a specified number of leagues within certain described boundary lines or natural objects, such as rivers, mountain ranges and parallels of latitude. Gen. Beale so surveyed the grants as to [illegible] water sources of the score [illegible] of streams flowing into the [illegible] looking solely to the future of the property as a grazing region for sheep and cattle. At that time it is hardly likely that Gen. Beale ever seriously considered the capability of converting the [illegible] into agricultural uses, and it is certain that the original grantors never dreamed of such a use being [illegible] them. Yet by surveying the [illegible] he did, Gen. Beale secured [illegible] rancho for all time, water [illegible] make entirely feasible the [illegible] of the larger areas of the [illegible]. There is water enough available on the Beale rancho to make [illegible] and a great deal of acreage [illegible] on the west, and not as [illegible] by the Kern River ditches, [illegible] finest agricultural and [illegible] districts in California. Whether the new owners contemplate the development and subdivision of the property, or whether they intend to hold it indefinitely in is present state, has not been determined. No such decision has been arrived at by its new owners, and no authoritative [illegible] of their intentions has been established. It is intimated, however, that subdivision is a project for the future, possibly the distant future. Among the purchasers, about thirty in all, are several of the nervy business men who compose the Los Angeles Suburban Homes Company, which bought, subdivided and handled so successfully six famous old ranchos [illegible] in the San Fernando Valley. At the ranch headquarters, on the south end of the Tejon grant, Gen. Beale caused to be planted about 100 acres of high tableland directly in the course of a clear mountain stream which flows continuously from one year's end to another. Here, with only the simplest kind of an irrigation system, consisting of gates tapping the natural flow, there has been developed an exceedingly fine orange grove, together with fig and olive groves, a mixed orchard of peaches, apricots, pomegranates and pears, and fifteen acres or more of vineyard. The products of this cultivated spot in a realm of grazing land are as nearly perfect as any fruits ever grown in California, and give convincing evidence of the soil possibilities of large areas of the vast property under the proper development. The oranges grown on the Beale rancho, Navels, Bloods and Mediterranean sweets, command the highest prices in Bakersfield, where the limited output is marketed. In addition to the small tract at the ranch headquarters that is given over to cultivation, there are always from 2,000 to 5,000 acres of barley which is grown for the hay only, and is a fed to animals on the place. These fields are only indifferently taken care of, yet their yield is the wonder of the valley people. To attempt to describe the physical characteristics of the Beale rancho in its entirety would be like essaying to record in detail the topographical features of one of the New England States, at least one of which, Rhode Island, it actually approximates in size. The climate of the several parts of the rancho is not the same, so greatly varied are the different physical conformations. Most of the Tejon grant and a considerable portion of the Castaic grant have precisely the right elevation and general temperature required for the production of semi-tropical fruits. It is, in brief, the truly golden Southern California climate. At some of the lower places the temperature is that of Bakersfield nearly the year around. In the southern end of the rancho, in the Antelope Valley portion, and against the foothills of the northern part of Los Angeles county, the vaqueros in charge of the Beale cattle experience a bit of real winter, with snow and frosty weather for days at a time. Here are grown a few apple trees that rival the best in Northern New York. In the Tejon Pass the summer temperature is like that of the Catskills. Experts declare that 140,000 acres, at least, of the table and foothill and valley lands, over which now roam thousands of range cattle, are capable of being irrigated from the water sources of the property, once the proper development is started. Here is enough land to make 1,875 farms of eighty acres each. This acreage is scattered — here a large parcel and there a smaller piece — all of it accessible, however, to any future transportation facilities that may reach out from Bakersfield, or come in from the south through the pass. On the Tejon alone there are at least 30,000 acres of land admirably adapted to citrus culture, with nearly 20,000 acres of similar ground adjacent in the northerly part of the Castaic grant, and in the various pieces included in the whole and lying to the west of the Tejon. These entire 50,000 acres lie practically in one body, and slope gently upward to the foothills of the Sierra Nevada. Thirty thousand acres or more of gentle, rolling hill lands in the original Tejon, and in the addition on the southeast are susceptible of a high state of cultivation for deciduous fruits and cereals. The flat lands along the western edge of the Tejon grant, both within its boundaries and in the lands bought from the railway, are of the same character as those a few miles nearer Bakersfield, which are given over to alfalfa culture, and which comprises one of the finest dairy centers in the State. Three-fourths of La Liebre grant is arable land, and at least 25,000 of its 48,799 acres are suitable for a high type of agricultural and horticultural development. Twenty thousand acres are especially adapted to the culture of almonds, which nut even grows wild in this section. More than 30,000 acres of the sloping hill lands north of La Liebre, and filling in the gap between this grant and the Tejon, are awaiting only the development of water to become a prosperous peach, apple and pear district. With the crudest kind of irrigation from one small creek, the Indians of the Beale rancho used in the old days to grow fifty centals of wheat to the acre in another portion of the same general region, and at least 15,000 acres are adapted to this kind of development. [A cental is a hundredweight, or 100 pounds.] Experiments have demonstrated that artesian well water is to be obtained in abundance in this part of the property. A large proportion of the mountain lands of the Tejon ranches is ideal pasturage, and will always be adapted to grazing, and probably be used for that purpose. The lands of this character have an estimated acreage of 25,000. Of the 50,000 acres or more of wood land on the entire tract it is declared by those familiar with the property, that a considerable proportion would, if cleared, become excellent grazing land, the soil of the mountains being almost uniformly deep and rich. The waste lands of the property though several thousands of acres in extent actually constitute a negligible proportion of the whole, and even these parts of the great holding will, it is believed, prove valuable for their deposits of iron, asphalt, copper and other minerals. There are outcroppings of limestone, marble and borax, all of which have been observed in quantities that surpass mere "indications." Oil seepages have been noted in various parts of the rancho ever since Gen. Beale came into possession of it, but no attempts at development in this line have been made. Coal has been dug for private use on the Castaic grant. To this day the Beale property is a stock ranch only, its owners and its manager regarding even the successful horticultural development at the headquarters as merely a side issue that is not to be seriously considered in a business light. 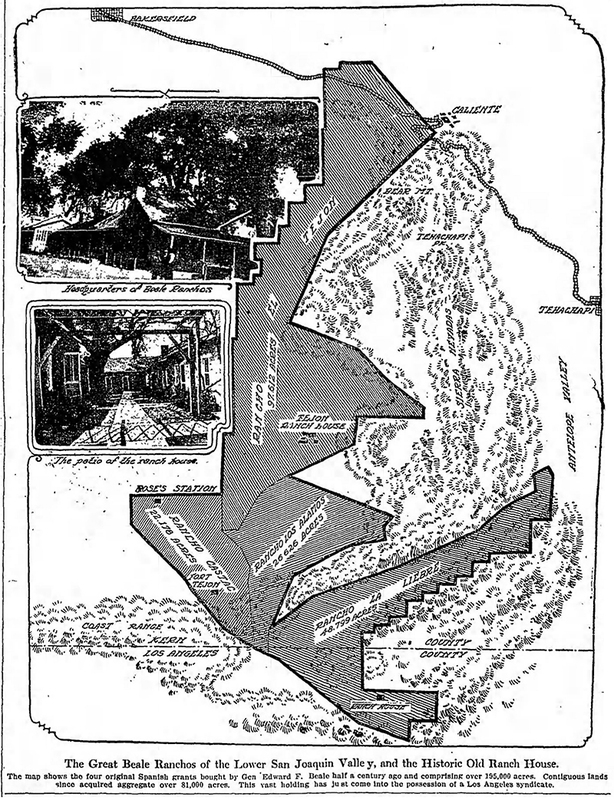 In 1891 at the time the Santa Fe was considering the purchase of the big property, an expert estimator for that company declared that the white oaks covering the mountains of the rancho were worth $4,675,000 as railroad ties and cord wood, and that even after taking out the tremendous expense of cutting and hauling to market, a net profit of $1,170,000 could be realized from the timber of the rancho. Yet to this day the forest wealth of the Tejon ranchos, nearly all of which is in the Castiac and Los Alamos grants, has remained practically untouched. The Santa Fe expert estimated the number of mountain oak trees on the place twenty-one years ago at 1,750,000, these covering 35,000 acres. There are at present on the Tejon ranchos in the neighborhood of 15,000 head of cattle, these being for the most part of the Durham and Hereford breeds. They range over the entire tract, grazing in large bands on the lower lands and in scattered bands in the foothills. Singly they often wonder far up the side of the mountains, until almost lost to sight in the oaks. Nearly 300 miles of fence are required to keep the live stock securely within bounds. The greatest number of cattle ever counted on the rancho at one time was 25,000, a quarter of a century ago, when the country was an open range clear to the Mojave and Kern rivers. Seventy-five men are employed on the rancho, all being under the direction of Superintendent Bailey, and most of them being Indians and Mexicans who have always lived on the place. Bailey is an Englishman and the nephew of R.M. Pogson, who was Major-domo for Gen. Beale for thirty years. The only other white man on the place are the bookkeeper, a general handy man, the stable man, one of the camp foremen, and an old "squaw man," Pete Muller, who in younger days had charge of all the sheep, and who is now passing his remaining years in a little house of his own near the main vaquero camp. Muller came to the San Joaquin Valley before Gen. Beale, and is the last of the living links between the remote days of the rancho and the present. His squaw, an Apache Indian, was a member of one of the tribes that roamed over the San Joaquin Valley before the coming of the Americans. Besides the main ranch house, there is La Liebre ranch house at the extreme southern end of the property; also large bunkhouses both at the headquarters and a mile west, at the main vaquero camp; a vaquero house at the site of the old fort in Tejon Pass, similar buildings at Rose's Station, seven miles west of the main ranchhouse, and at Crocker place in Los Alamos grant, together with four camps for the fence riders. The whole rancho and the manner in which it is conducted are typical of the ways of forty years ago. Here is the real old West brought down to the day of the automobile and the airship. They are real cowboys who round up the Tejon cattle year after year, and not moving picture heroes. The Indians of the Beale rancho live in a little village of their own in the heart of an oak grove that looks like an English park. Here they have a little mission church built for them by Gen. Beale nearly forty years ago, and which is visited once every three months by a Spanish padre from Tehachepi [sic; old spelling]. Gen. Beale found the Indians of the valley in a state of savagery, living miserably on grasshoppers and acorns, and without initiative to strive for anything better. In his capacity of Superintendent of Indian Affairs for California, he aided them to emerge into a condition of comfort and civilization that was a source of astonishment at Washington. When the government later undertook to remove all the tribes at the lower end of the valley to the Tule River Reservation, a large number of the natives declined outright to leave the employment of the rancho, and many others found their way back within a few months. Probably fifty Indians live at the little ranch community at this time, and these are regarded as ideal employees. Another point of great historical interest is the ruin of old Ft. Tejon in the Tejon Pass. Only one of the original buildings, the officers' quarters, is today standing, this being occupied by the vaqueros of this division. After the government abandoned the fort it became the stopping place of roving bands of tramps, the "I-Won't-Work" element of that early day — visitors who, being too lazy to cut and carry in the fuel which existed in abundance close at hand, made a regular practice of starting their fires with the flooring and woodwork of the post building. These fires were invariably left burning and the greater part of the fort was eventually destroyed as a measure of protection to the timber of the vicinity. All that remains of the fort, with the exception of the officers' quarters, is a bit of crumbling adobe wall here and there over the site. The main ranch house of the Beale ranchos is in point of unstudied picturesqueness worth taking a long journey to see. The walls of the building are of adobe throughout; the roof is shingled, and, far from suggesting the mission style, the house as a whole, makes one think of the Colonial types. The beauty of the place lies in the fact that it was not deliberately planned to conform to any style — that it was in fact never designed at all, but simply grow into its present low, rambling shape. The long end portion of the place, containing the dining-room and kitchen, was built by the original grantor long before Gen. Beale ever saw the San Joaquin Valley. In the old days a part of the space which is now used by the Chinese cook and his two oriental assistants was utilized as a sleeping room. Gen. Beale added a room at each end of the original house and extending at right angles to it. This was followed by the addition of two more rooms extending outward in the same manner and constituting the real beginning of the house as it now stands. Other additions were made as the years went by, until the dwelling now contains a total of seventeen rooms, all looking into a patio, in p the center of which stands a huge oak whose branches extend in an attitude of blessing over the whole house. Two walls are almost concealed in many places by ivy and climbing roses. There is no hospitality like the hospitality there. Every room of the house has its open fireplace, in which is piled, all ready for lighting, dry oak wood. An acetylene plant supplies better gas than most city people boast, and the place is as well piped for water as a hotel. A library of good books is at the disposal of every visitor. The owner years ago built a plunge, which is kept constantly filled with clear mountain water; and at a short walk from the house is a natural sulphur spring, which is at the ideal temperature for a hot water bath the year around. The vegetables consumed, like the meat, come from the rancho itself, and it is not much in the way of food that comes from Bakersfield, forty miles away. The gardens are carefully, almost critically, cultivated by Chinese, who live in a quaint little wooden house fashioned around the base of a gigantic fig tree, whose overloaded branches have to be propped with strong poles. Trees and houses are covered with vines, and thus, literally, "John" lives under his own vine and fig-tree. On the grounds about the house are groves of splendid oaks and giant sycamores. The fig trees are beyond all doubt the largest in the State, and have flourished from early days. There are several large and curiously distorted mesquite trees on the place, the only ones of their type in the vicinity. The finest of the orange groves, and a grove of ancient olives stand directly south of the house, while just across the mountain stream, and not over fifty feet away to the north, is a veritable jungle of wild grapevines. The ranch store, a large adobe structure built in 1867, stands near the house on the west, and a few hundred feet beyond is the main ranch bunk-house. A quarter of a mile northwest of the house is the largest of the orange groves, from which are annually picked hundreds of boxes. Another thriving grove lies about equidistant to the northeast. Snowcapped mountains, dominated by imposing Mount Tehachepi, form an admirable setting to the whole. Among the principal points of interest on the rancho is an old grove of spreading oak-trees fully a thousand acres in extent, and lying about a mile northeast of the house. There are, too, the Twin Lakes of La Liebre grant and Lake Castaic in the Castaic grant, the latter a charming body of water high in the mountains, and bordered with oak trees. In the vicinity are to be had excellent hunting and fishing, and many deer and some bear are brought down annually by the vaqueros riding the range. A visit to the Tejon ranchos will suffice to disprove the myth that the wild pigeon has disappeared from California. Flocks of tens of thousands of these birds often roost in the oak trees of the home place. Wild geese are seen in great flocks, besides all other birds native to that part of the San Joaquin Valley from remote times. The climate of the greater part of the Beale rancho is essentially the same as that of Los Angeles and its vicinity, the principal difference being found in the lands south of the main mountain chain, where it is much colder in the winter than in the ocean region. Over a limited area of flat lands, the summer weather is hotter also than comfort would dictate, owing to the absence of those fogs which bless the regions nearer the sea. The annual rainfall at the ranch house averages about twelve and a half inches, although at most points on the property, it is somewhat higher. Such frosts as are experienced have never been known to affect the citrus trees of the small developed area about the main ranch house or the little tract of apple and peach trees at La Liebre ranch house. Oranges and lemons, an well as olives, have weathered an occasional light snow for decades past. In the spring, thousands of acres of the ranch blaze with the gold of poppies ("copa de oro"), and other tens of thousands of acres are carpeted with lupins and other flowers. The highest point on the ranch is 5,000 feet, and La Liebre grant has a general elevation of 3,500 feet above sea level. All but the western edge of the Tejon grant is high enough to escape the extreme heat that affects Bakersfield and the country immediately surrounding it. A large part of the rancho is at an elevation of from 1,000 to 2,000 feet. Bakersfield is as yet the only trading point for the rancho, and the only market for its products. 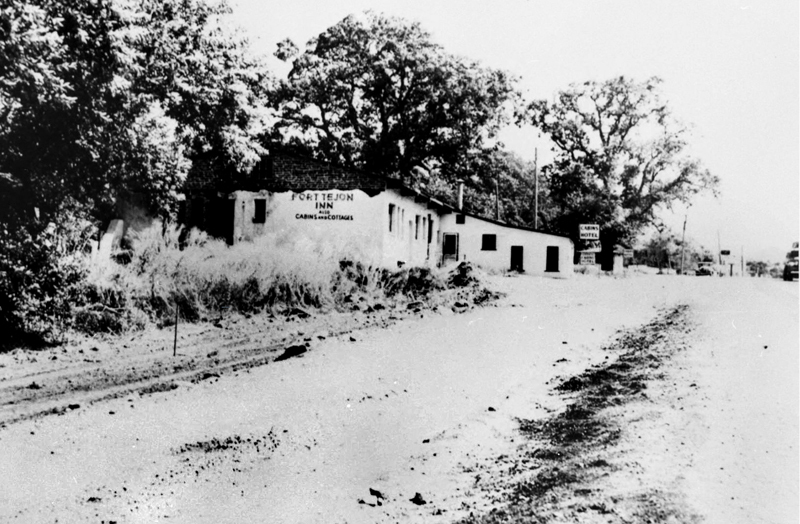 Rose's station, the westernmost camp of the property, lies on a north and south county road exactly thirty-five miles from Bakersfield. The improvement of this road and its extension through the Tejon Pass has long been earnestly agitated, and probably the majority of the citizens of Bakersfield favor Tejon Pass over the Tehachepi as the route for the coming State Highway. This highway will, however, cross the rancho, whichever route may be adopted, as it would practically parallel the line of the Southern Pacific Railroad for fifteen miles through the northern part of the Tejon grant, if the State should decide to take the longer course through to Los Angeles county by way of the Tehachepi Pass. The time when a railway will be constructed through Tejon Pass to connect Los Angeles with San Francisco by a new and shorter route may not be far away. Such a line would open up a wonderfully rich territory, including the lands of the Beale ranchos, if it should transpire that the new owners were intending to develop the tract, or any large part of it, in an agricultural and horticultural way. A road extending south from Bakersfield only to the junction of the Sierra Nevada and Coast ranges would serve to add a rich field to the back country of the chief Kern county town. There is no question as to the feasibility of either project, even as there is no question as to the possibilities of the rich and undeveloped section through which either line would run. The country from Rose's station to Bakersfield offers not a single difficult engineering problem to the railway builder, and the Santa Fe, twenty years ago, decided that the Tejon route was entirely feasible from every consideration. In the strip of irrigated lands extending from Bakersfield southeastward, almost to the Western line of the Beale rancho, may be discovered the real possibilities of the greatest part of the district southeast, as well as south and southwest of Bakersfield, and taking in that part of the Beale property lying in the San Joaquin Valley, together with tens of thousands of acres of other lands. It is only a question of the development and perfection of the untouched water resources of the Tejon ranchos, and of getting a railroad. Here is a great property and a great project. Percy H. Clark of Los Angeles acted as agent in the sale.